Tony Blair is increasingly out of touch with voters and his party cannot afford another year of "division and drift", a senior Labour MP has said. 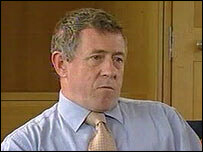 Ex-minister John Denham said he would have preferred an early change of leader, but now realised that it would tear the Labour Party apart. He told BBC Newsnight there had been some real problems in Mr Blair's leadership in the last year. Mr Blair has promised a "stable and orderly" transition of power. Mr Denham's comments will be seen as significant as he is a respected figure in the broad centre of the Labour Party. They come as a new opinion poll suggests Mr Blair is the most unpopular Labour prime minister in modern times. The YouGov poll for the Daily Telegraph suggests 26% of voters are satisfied with Mr Blair's performance - lower than Harold Wilson's 27% in May 1968 after the devaluation of the pound. The internet survey of 1,910 adults, conducted on 8 and 9 May, puts the Conservatives on 37%, Labour on 31% and the Liberal Democrats on 17%. Mr Denham said: "There are some real problems with the leadership of the prime minister as it's been over the past year or so." Despite his own desire for an early handover, Mr Denham said the weekend showed that "any pressure about the leadership was just going to tear the Labour Party down the middle and we are never going to recover". "So there's not likely to be an early leadership change," said the MP, who is chairman of the Commons home affairs committee. "It is critically important though that next year is a good year for the Labour Party, not a year of division and drift like we had last year." He said too much energy had been spent on parts of anti-terror laws which would have a marginal effect on security. But far too little had been done in society as a whole "in winning hearts and minds in the battle against violence". Mr Denham, who quit the government over the Iraq war, said Mr Blair had shown a "paranormal instinct" for what the people of Britain wanted in his early years in power and had led from the centre. "I don't think it's a surprise that inevitably, although that has not gone entirely, that gift is fading and it means that we now have a style of government led from the centre which looks more out of touch with voters than it used to," he said. "That's what we've got to adjust and get right in the coming year." The government could show it was taking a new approach by making more changes to the Education Bill to meet the concerns of "constructive" criticisms, he said. But the prime minister's official spokesman said Mr Blair had been "elected a year ago on a programme of reform. "He believes he is doing what voters want," he said. Labour sources said the "vast majority" of MPs supported his stance. Mr Brown recalled how Margaret Thatcher had left Downing Street, saying "it was unstable, it was disorderly and it was undignified". "I think we will prove to the world that we can do these things in an orderly, dignified and sensible and proper way, and do it in a way that is unifying as well as unified," he told GMTV. Mr Brown said Labour had to show people it was worthy of their trust.